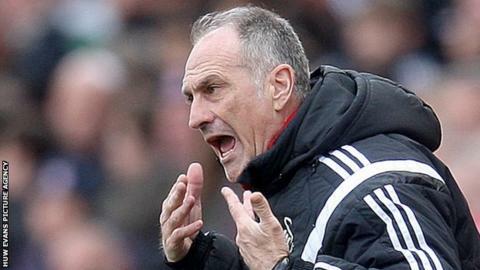 Swansea City head coach Francesco Guidolin says he wants to ensure Premier League safety before holding talks with chairman Huw Jenkins over a new contract. The Italian's current deal expires at the end of the season. With the club 10 points clear of the bottom three with six games left, the Swans look set for a sixth consecutive season in the top flight. "I hope to have talks with the chairman in the next few days," said Guidolin. "When Premier League certainty is real I hope to have the possibility to speak with my chairman." The 60-year-old also again dismissed reports linking him with the Italy manager's job, which will be made vacant in the summer by Chelsea-bound Antonio Conte. "It would be an honour for me if my name is on the list because I'm Italian but I would be proud to work here because I like working here", said Guidolin. Ghana forward Andre Ayew is set to return for Swansea against Chelsea on Saturday after recovering from an ankle injury. But Leon Britton and Jordi Amat are injury doubts for the Premier League encounter at Liberty Stadium.